Our team has a strong practical grounding in energy risk management, bringing experience from senior roles within the industry. Clients who have engaged us to provide advice on risk management include supply & trading functions, utilities, producers and investment funds. We are experts in the governance of risk, including risk capital allocation, limit setting and risk policy development. 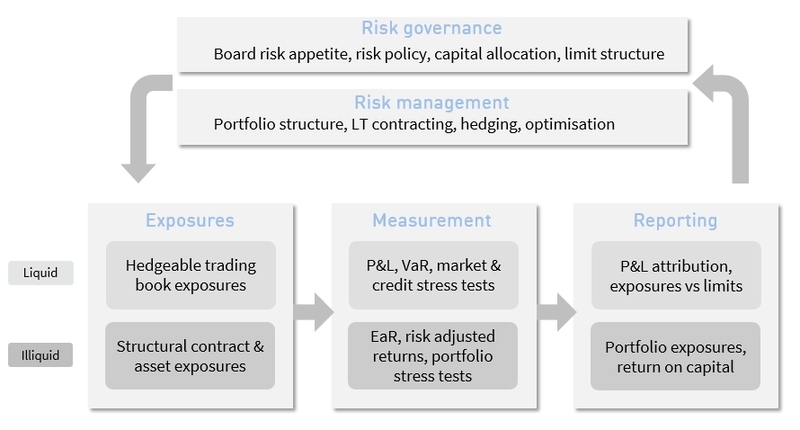 We also have extensive experience of the identification, measurement, monitoring and control of market and credit risk exposures, summarised in the diagram below. Timera Energy has a sophisticated in-house risk analytics capability that supports our work with clients. This covers asset valuation, probabilistic risk measurement (e.g. EaR, CFaR, CVaR, PFE), risk metrics and stress testing frameworks. Our analytical capability spans the asset lifetime horizon, from the management of asset risk in spot and forward markets to long term exposure management and portfolio structuring. Objective: We were engaged to support the client in evolving its risk management capability to support LNG trading & midstream activities. Deliverables: We worked with the risk team to develop a valuation, including curve methodologies and an exposure reporting tool for the LNG portfolio and hedges. Results: The tool was implemented and used for reporting of LNG portfolio value and exposures. Objective: We were engaged to advise on the deconstruction and measurement of risk exposures from long term supply contracts and the European gas & LNG trading books. Deliverables: Scope covered exposure deconstruction analysis and engagement with client stakeholders via multiple workshops. Results: Our work supported the deconstruction and measurement of portfolio exposures in the client’s risk management systems. Objective: We provided advice on the exposure deconstruction, risk measurement and hedging of oil-indexed swing contracts. Deliverables: Scope covered analysis of contract structures & exposures, and engagement with the client in a workshop format. Results: Our work supported the client in the client’s understanding of practical considerations in measuring and managing the risk from gas contract exposures. Objective: We were engaged to develop an ‘Earnings at Risk’ capability to support generator portfolio risk measurement. Deliverables: Project scope covered design, development, testing and implementation of the EaR capability on the client’s desktop. Results: Our work supported the practical implementation of EaR as the primary metric against which portfolio risk is measured and managed. Objective: We were engaged on multiple assignments to work with the client in developing its risk governance and policy framework. Deliverables: Our role involved the development of several new areas of the governance framework and included extensive engagement with trading and risk management stakeholders. Results: We worked with the client to develop & refine proposals that were submitted and approved by the Risk Committee.